The room was filled with chatter, laughter and the sounds of friends eating lunch together. Girls were scattered throughout the room, filling chairs, sitting on the floor and standing to make room for more girls coming in. At the front of the room sat three chairs, filled by SBS student leaders with hearts to minister to others. 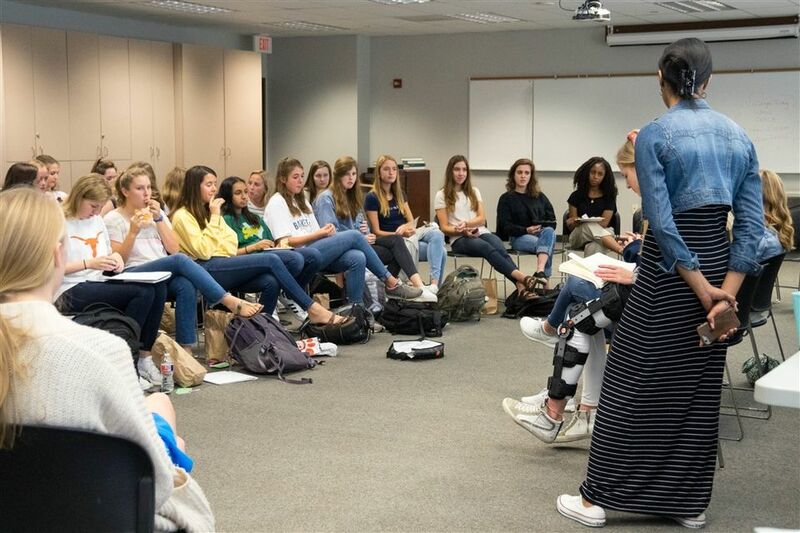 One such leader is Mary Turner ‘20, who began this new SBS Bible Study, Girl Talk, with the help of SBC High School Girls Associate Leah Green, this school year. Grown out of a love for the Bible and a calling to minister to her peers, Mary asks students to pick topics they want to hear about and see what God has to say about those things. They are covering a range of topics stemming from the central theme of identity. The Bible study begins with a certain truth or verse related to the topic of conversation written up front for the girls to read and meditate on. From there, the conversation is lead by students with guidance from Leah. A discussion based study of God’s word begins as they relate to one another, ask probing questions and turn to the word to search for answers.